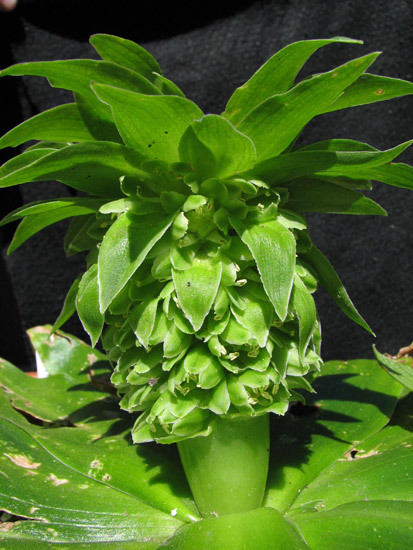 Eucomis is a southern African genus in the Hyacinthaceae family. 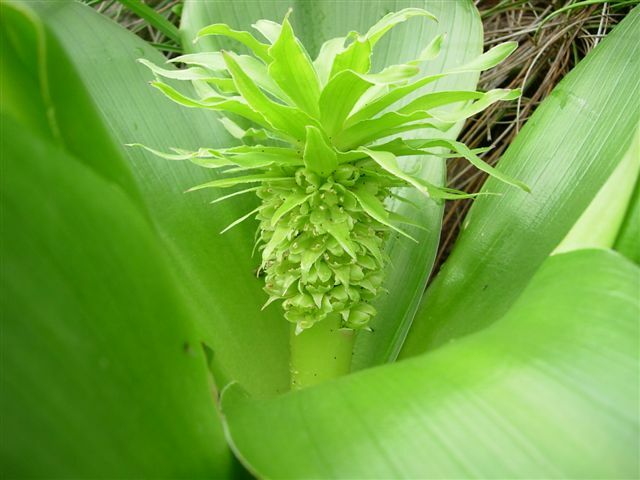 Plants are commonly known as Pineapple lilies because in many of the species the blooms resemble a pineapple. 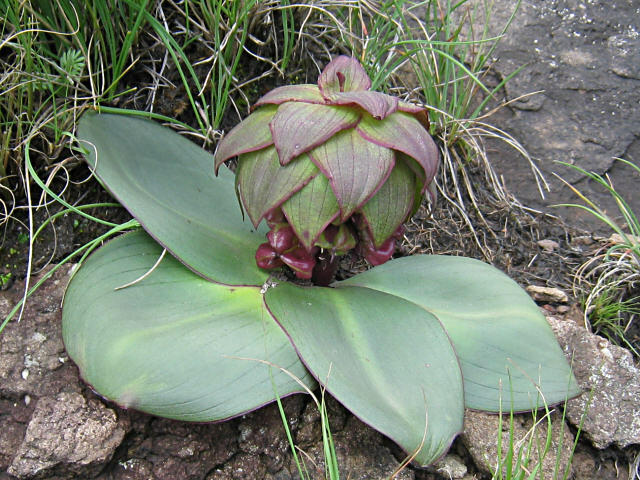 Most of the species are found in the summer rainfall areas of South Africa, some at higher elevations. 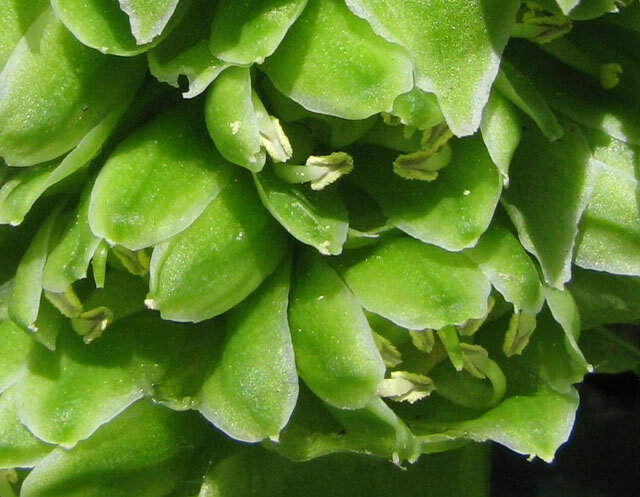 Plants from G-Z are found on this page. 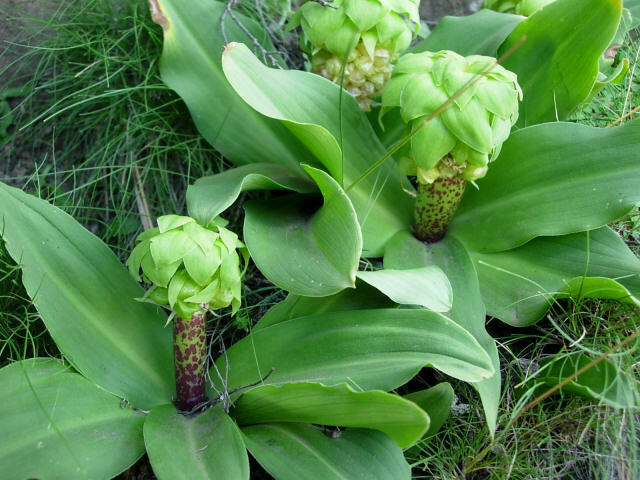 Eucomis grimshawii grows in shaded, seasonally wet, south-facing grassy slopes below overhanging rocks, in rich, heavy black soil and in boggy conditions in the Drakensberg Mountains. 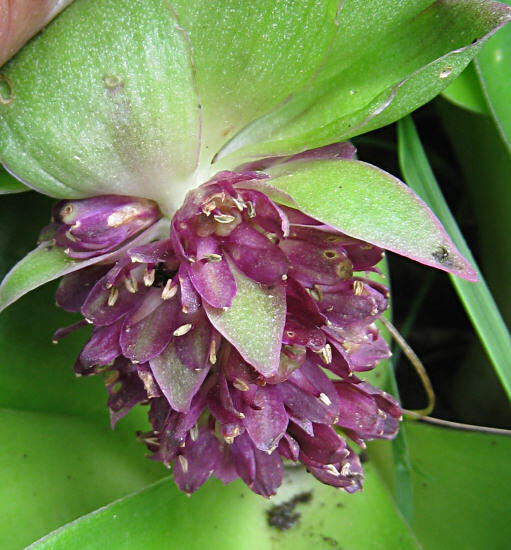 It is the smallest species in the genus growing to 8 to 10 cm. 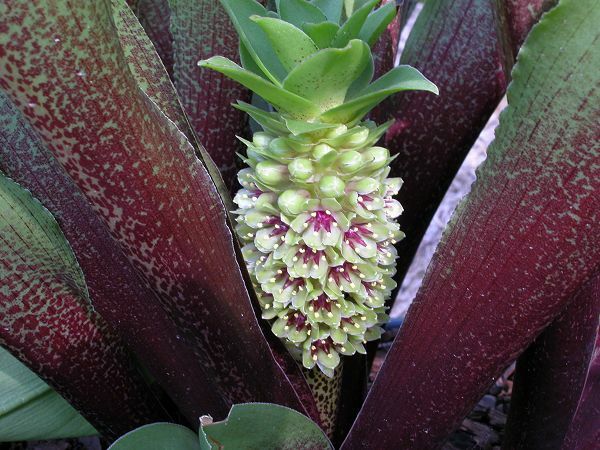 The scape is spotted and flushed maroon-magenta and the fragrant flowers are greenish white. 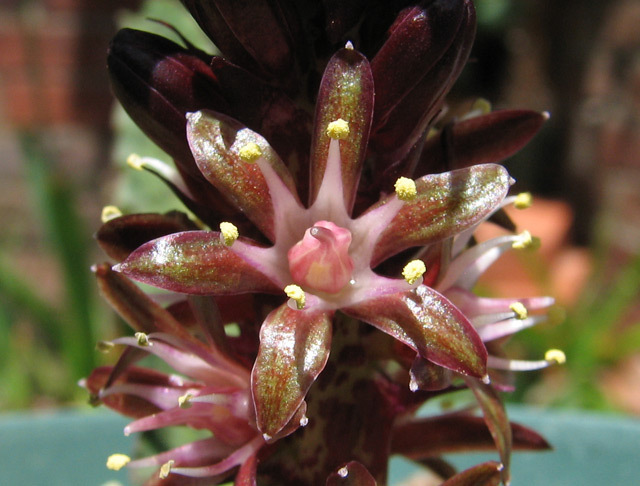 This species is most similar to Eucomis schijffii. 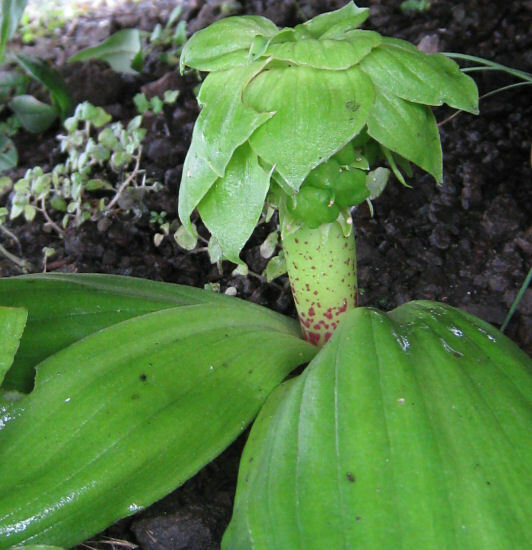 This species is named after John Grimshaw. For information on its discovery see his blog. Photos by Cameron McMaster taken at Tiffendell and in seed at Naude's Nek. 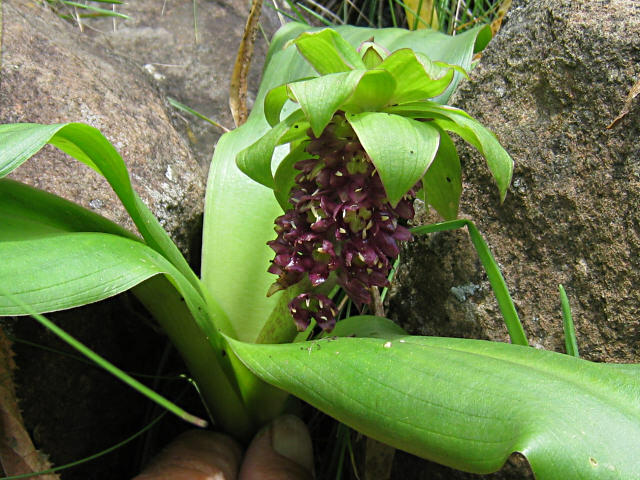 Eucomis humilis is endemic to the Drakensberg alpine region where it is found in rocky stream gullies, wet rock overhangs, and in grasslands. 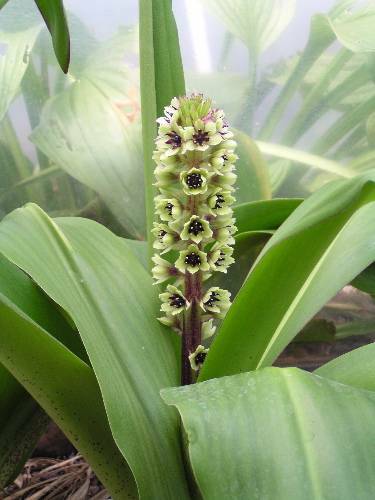 It has keeled leaves with wavy margins tinged purple and is spotted purple below. 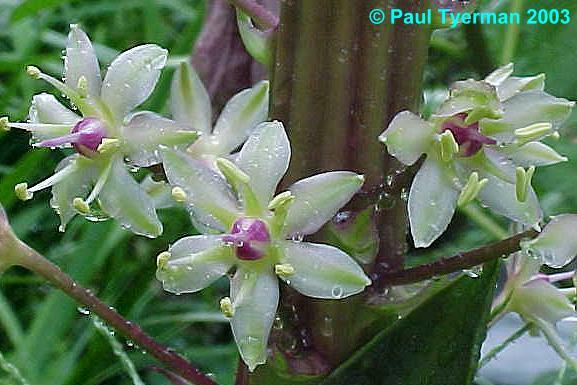 The inflorescence has a dense tuft of small bracts edged purple and the stem is spotted purple. 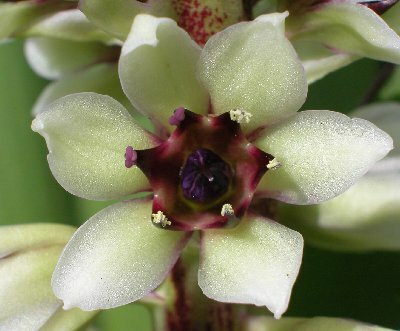 The flowers are greenish white tinged or edged purple with purple stamens. It has an unpleasant scent. Photo by Andrew Harvie. 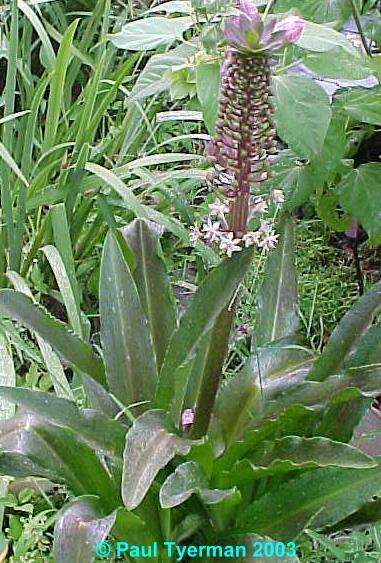 Eucomis montana grows to 30 cm and has erect leaves without wavy margins, purple stems, and green to white flowers with purplish brown stamens and ovary. Tony Avent describes this one as having the best flowers with the anthers appearing fused, creating a dark eye against the white petals. In cultivation it tends to be taller than in the wild. Photo #1 by Ellen Hornig. Photos #2-3 supplied by Andrew Harvie. 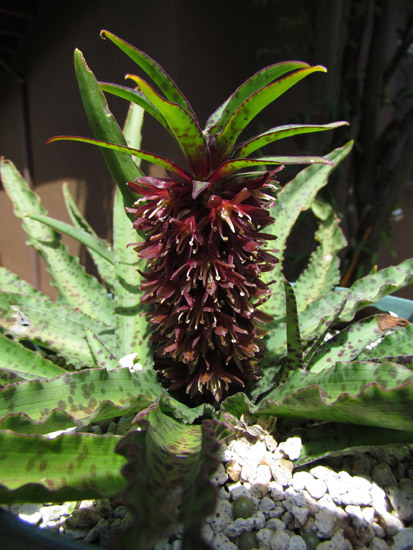 The last two pictures were taken in Harry Hay's gardens by Lee Poulsen of what is probably this species or perhaps a hybrid of it. 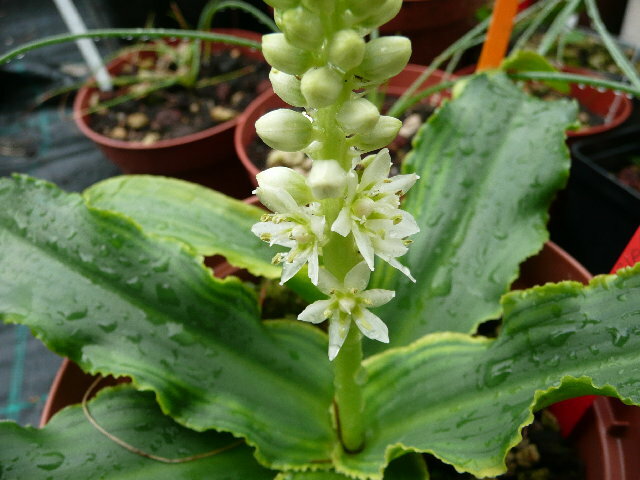 Eucomis pallidiflora ssp. pole-evansii (N.E.Br.) Reyneke ex J.C.Manning, syn. 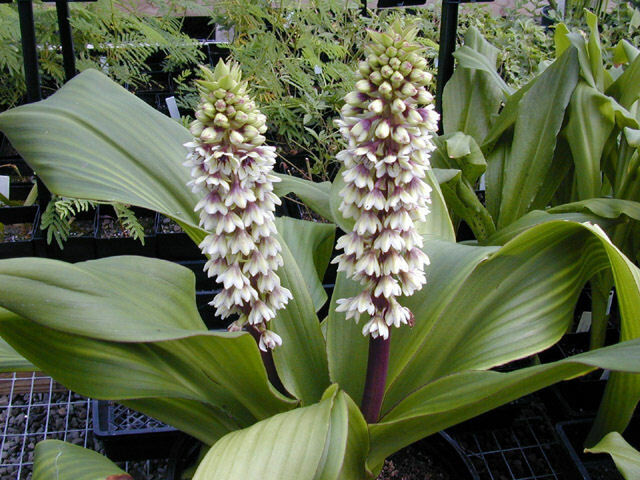 Eucomis pole-evansii, is the tallest species of the genus, growing to 1.8 m/6 ft. 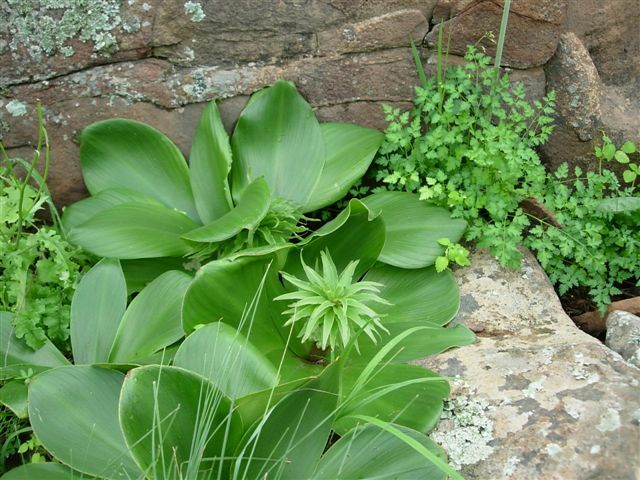 In the wild it prefers wetland habitats, but it will grow in average garden soils, if regularly irrigated. 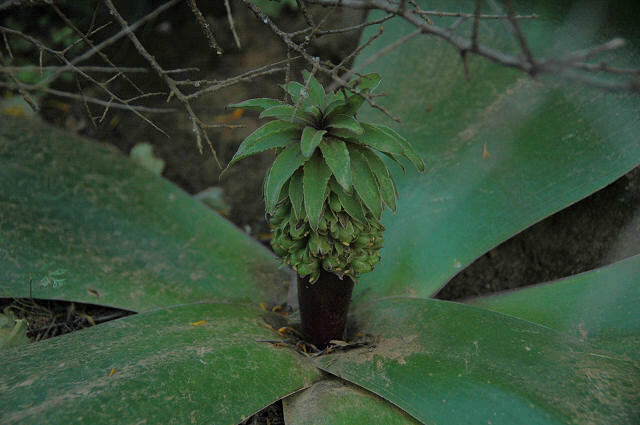 It has leaves over 1 m long, wide at the base tapering along their length. 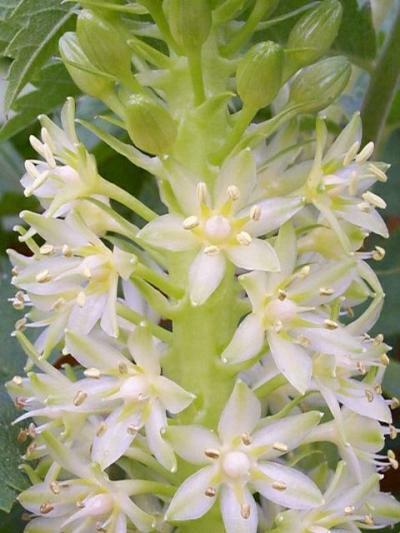 The wide open green to cream flowers appear mid summer, but may need staking to prevent them from bending over. The first photo by David Fenwick. The second photo from Ellen Hornig illustrates how tall it can get. 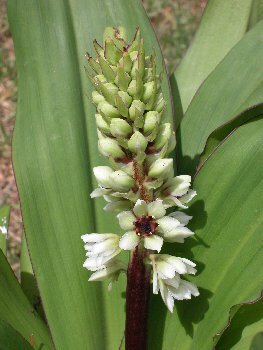 Eucomis regia, the only species from the winter rainfall part of South Africa, has prostrate leaves and cream to greenish flowers. 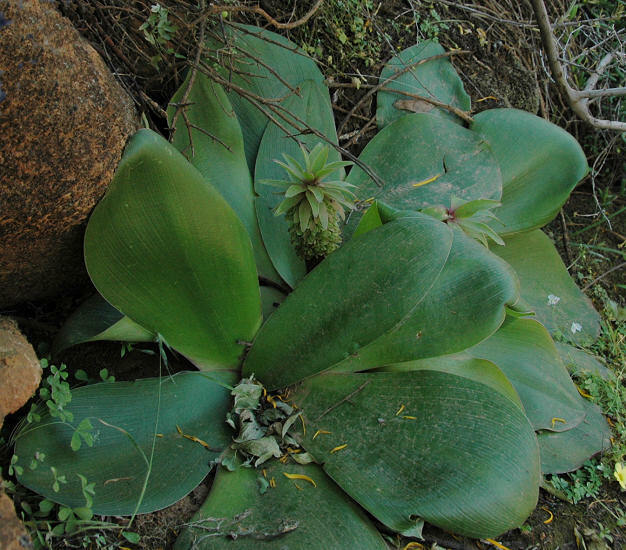 Photographed in Nieuwoudtville where it was growing in the reserve in doleritic boulders July 22, 2005 by Cameron McMaster in the Bokkeveld Plateau. The form in the first two photos was much larger and blooming earlier. 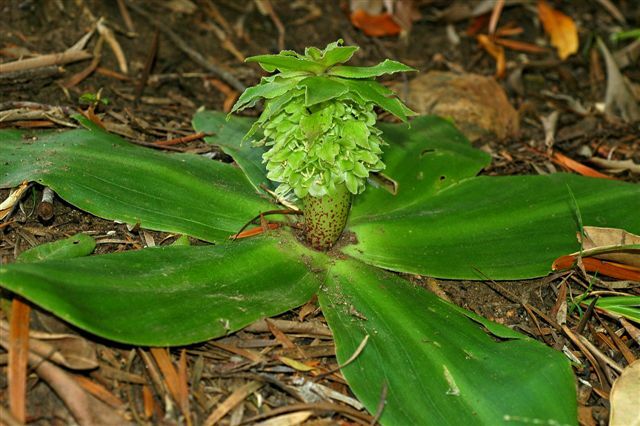 The third photo, also taken by Cameron illustrates the smaller form of Eucomis regia that grows in the Caledon and Bredasdorp districts of the West Cape in the Overberg. 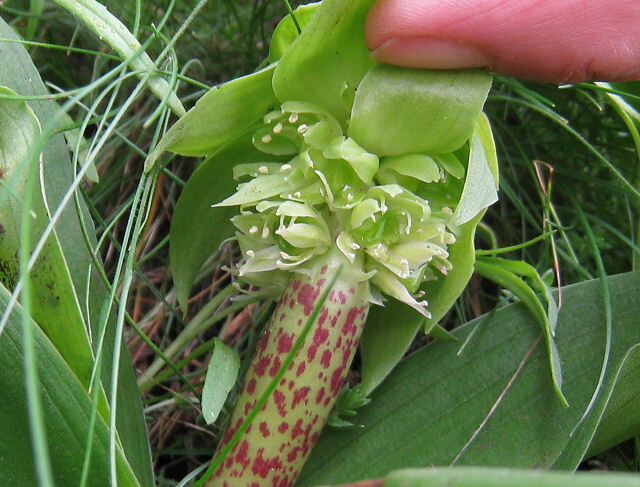 It is common in shale soil usually on southern aspects where it is protected by fairly rank overgrowth. The fourth and fifth pictures were taken in Namaqualand by Bob Rutemoeller. These plants were growing off the road, but high on the edge of the bank. 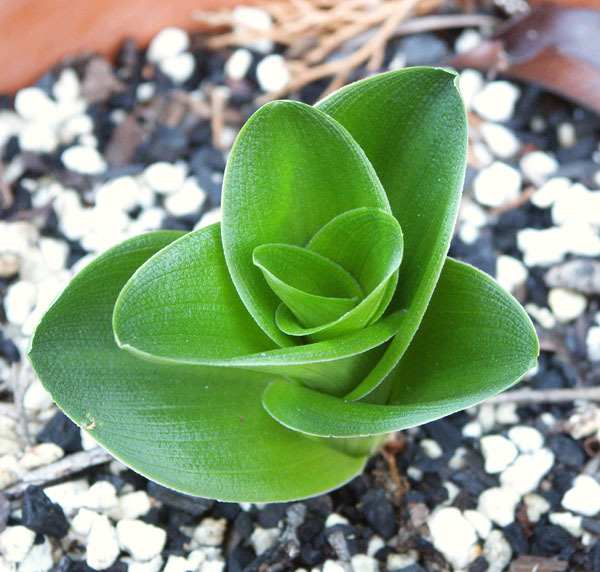 Photo 1 taken by Jacob Uluwehi Knecht is of a cultivated plant in California as it begins to break dormancy. Photos 2-3 are flowers of the same plant taken by Nhu Nguyen. 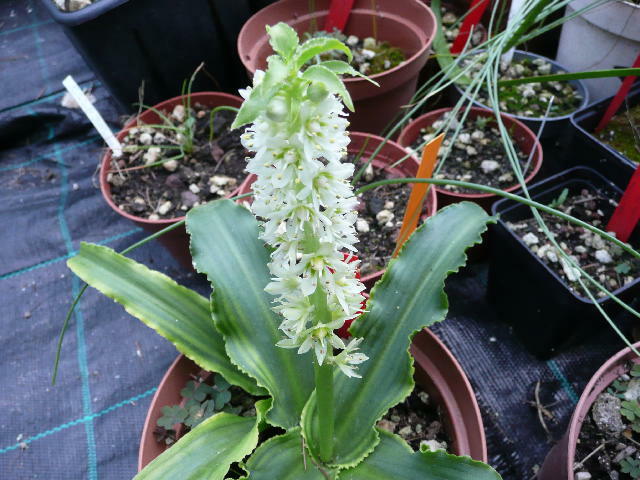 Eucomis schijffii is a dwarf species that grows to 10 cm and is found in wet basalt gravel or rock faces at 2300 to 3200 m. It is endemic to the Drakensberg alpine region. 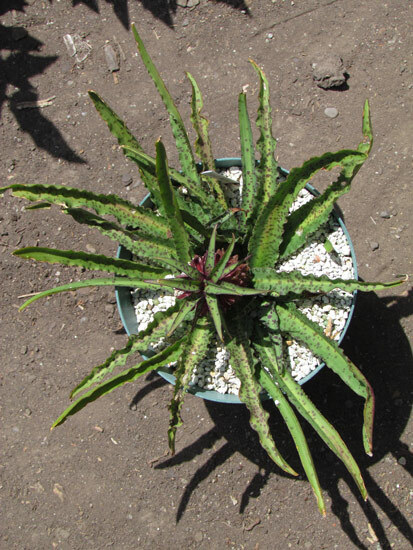 It has 3 to 4 prostrate leaves with grooved veins that are maroon tinged on the reverse. 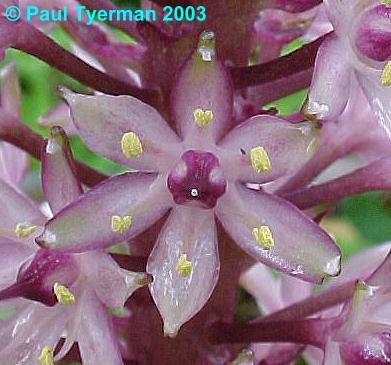 Flowers are dull dark red or purple with purple stamens. Photos taken by Cameron McMaster at Sentinel Peak. 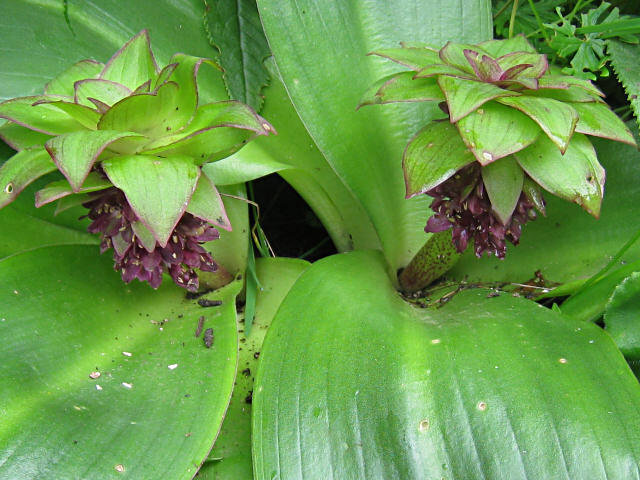 Eucomis spp. 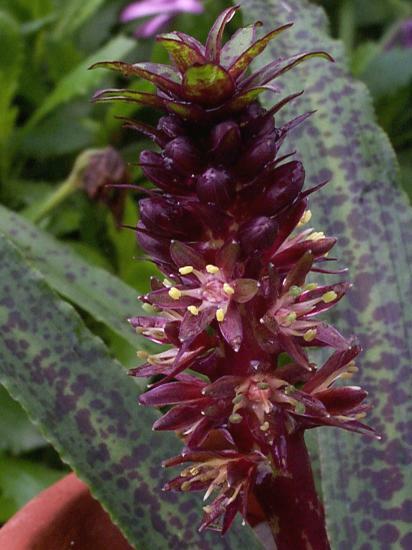 These pictures by Paul Tyerman are of a purple leaved Eucomis, probably a hybrid of Eucomis comosa. 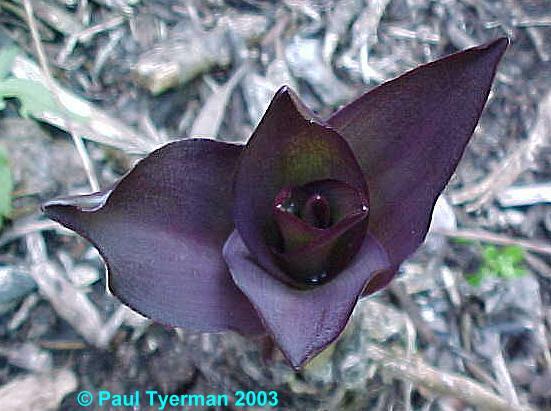 The purple-leaf with white flowers shoots almost black when it first emerges, fading out to deep purple leaves when fully unfurled. 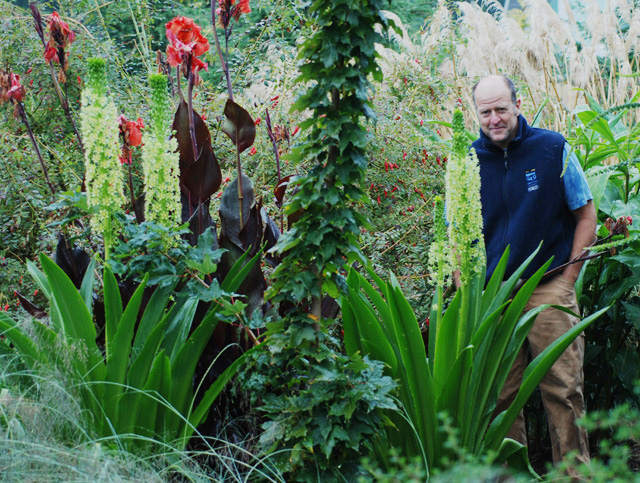 Over the course of the season they slowly fade until at flowering they are green with an overlay of bronze, topped by a 1 m or so tall stem of white flowers. 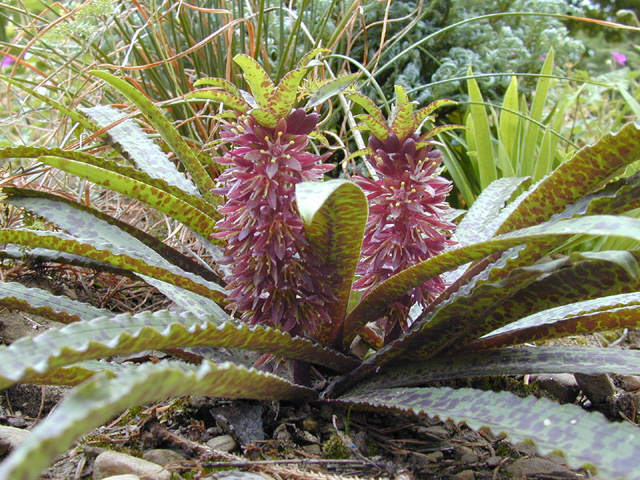 The purple-leafed with pink flowers shoots dark purple, then the leaves slowly fade to green by flowering. This has attractive pink flowers which I rather love. Only a couple of feet tall though. 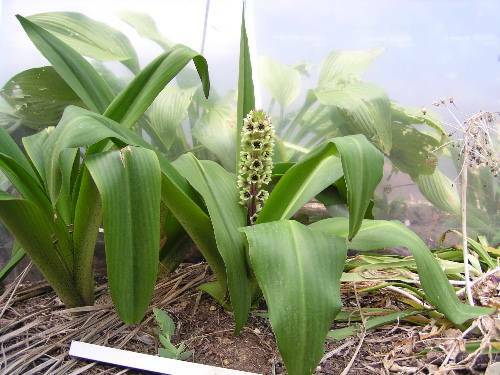 These plants are most likely hybrids between both Eucomis comosa and Eucomis pole-evansii David Fenwick speculates. 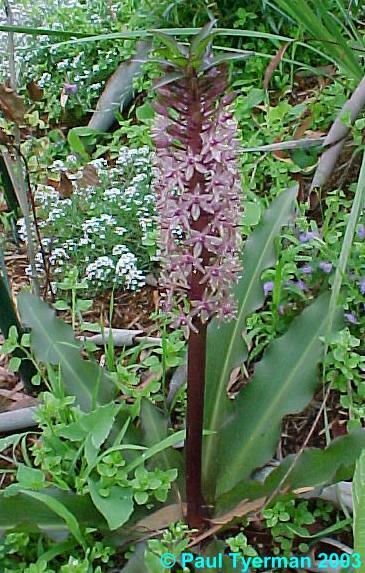 Eucomis vandermerwei grows in grassland in the northern province of South Africa and flowers mid summer. 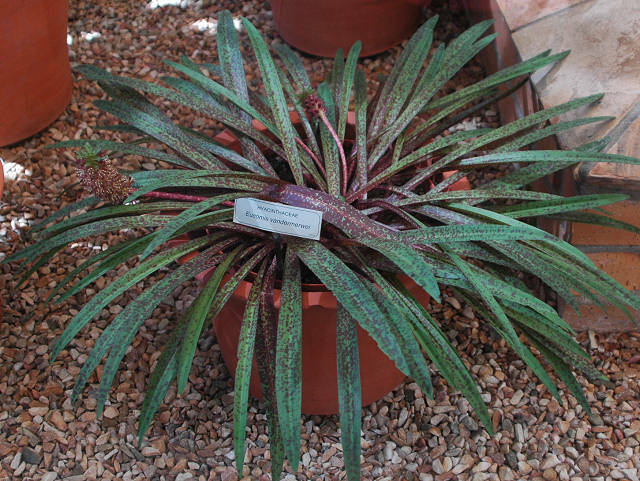 It is a dwarf species, with a small rosette of purple spotted leaves. 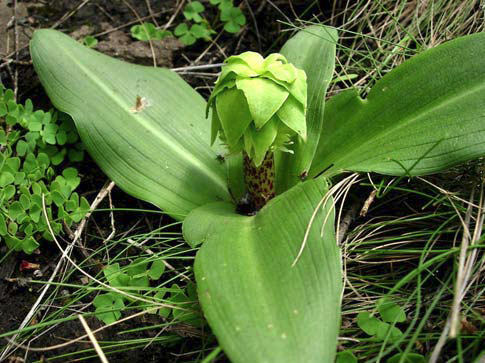 Leaves of this species are approx 20 cm long, pointed and slightly undulate at their edge. 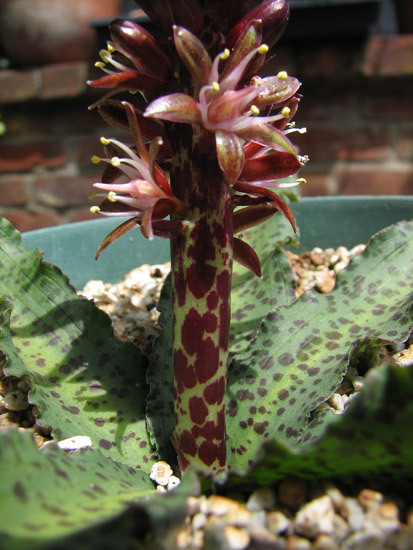 With a short spike of purplish burgundy flowers, this species can be slightly variable in its markings.The first two photos by David Fenwick shows several varieties of leaves and the second flowers. 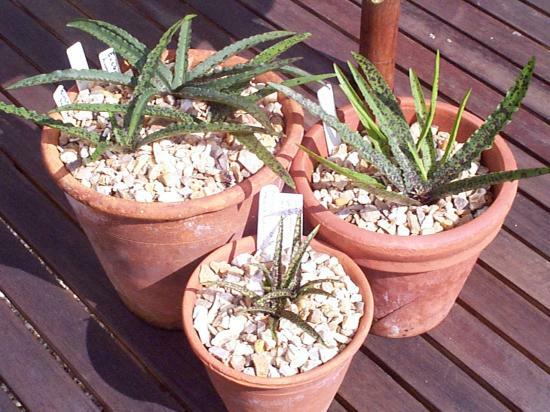 The third picture from Mary Sue Ittner shows a pot on display in the Kirstenbosch National Botanical Garden bulb room. The last photo was taken by Ellen Hornig. The photos below were taken by Nhu Nguyen of a more vigorous form from Roy Herold that divides pretty rapidly.